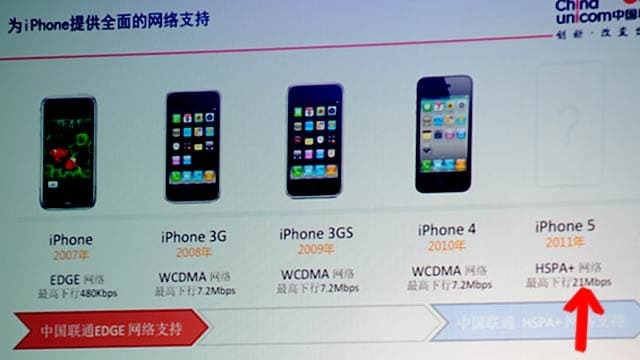 During a conference at Macworld Asia, the exclusive and only carrier that have the iPhone in China, China Unicom, confirmed that the iPhone 5 will support 4G HSPA+ which offers a theoretical data speed of 21 Mbps. That’s three times faster than the current data speed on iPhone 3G, 3GS and iPhone 4 that only offer 7.2Mbps. Many of us were expecting 4G LTE which offers a ridiculous data speed of 150 Mbps, but that is unlikely to happen. Apple is not using 4G LTE anytime soon because the iPhone would have to be thicker and 4G LTE consumes to too much battery. And although 4G LTE is fast, is not available in many cities yet. In the US, AT&T and T-Mobile have HSPA+ networks, covering more customers than LTE.